In most industries, the metrics that have been long established to measure success are generally tried and true reflections of the successful parties best interests. In the advertising and publishing industry, we can truly say that this is not the case. This becomes clear when you start hearing publishers, ad ops teams, and site owners debating and quoting eCPM vs. RPM as key metrics to determine a site’s earnings vs revenue success. 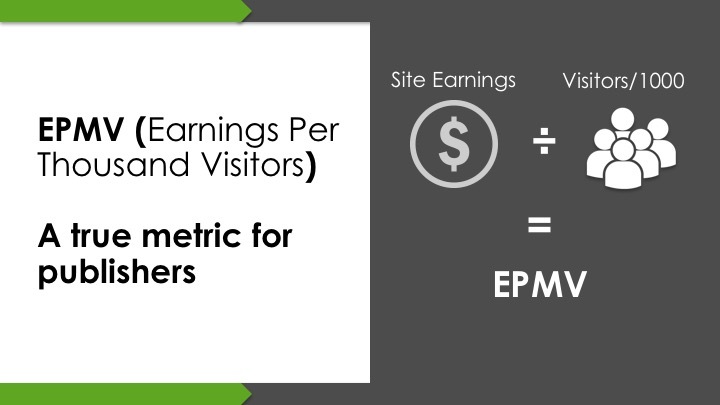 The flaw in this equation is thinking that eCPM or RPM is giving you a metric that is a “true north” for overall site earnings. CPM, eCPM, and RPM could all be going up but your site revenue, SEO, visitors, and UX metrics could all be theoretically going down (in fact, we’ve seen it happen… a lot). Below I’ll explain the math behind this and outline the simple formula that will allow you to consistently (and simply) measure the direction of site revenue/earnings; while taking into account things like visitors, SEO, bounce rate, pageviews per visit, and other UX metrics. CPM vs. RPM actually doesn’t matter. There’s another metric that actually is better for optimizing total revenue that is easier to calculate. Before we dig into exactly how you can account for all of this — and we reveal the math and solution below — it’s probably good to provide some context. CPM, eCPM, and RPM are metrics that are well-accepted by the online advertising for good reason, and without understanding that you may not fully grasp why there is so much parody in the industry for using them. 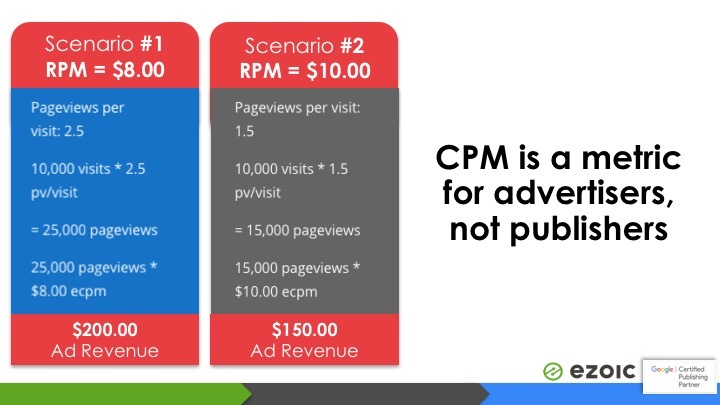 CPM and eCPM are metrics for advertisers, not publishers. This isn’t hidden. It’s in the name; “cost per mille (thousand)”. It is outlining the cost for the advertiser to buy your ad inventory (space on your website). What’s the difference between CPM and eCPM? CPM is the cost per mille for an individual ad unit. eCPM — or effective CPM — is the total cost for all the ads on a page of a publisher’s website. A CPM is the price paid for a single ad space and eCPM is the total price paid for all the ads on a page. What’s the difference between earnings vs revenue for ads? Nothing but semantics really, they are both terms used to describe the monetization of ad inventory by publishers. Now, you might be saying, “if they pay more for my inventory, aren’t I making more revenue (or earnings)”? The answer is simply, no. We’ve seen over and over again that ad eCPM and CPMs aren’t the best indicators of overall revenue improvement. Even RPM — which looks at revenue per thousand impressions — does not present a directionally accurate metric for publishers because it does not additional pageviews during a visitor session (RPM is essentially the same as eCPM, by the way). RPM also does not take into account earnings, visitors, SEO, and critical UX metrics that drive a site’s long-term success. This is sort of redundant. But, RPM refers to the total of all CPMs on the page and CPMs are the price paid for a single ad location. Optimizing your website around either will ultimately lead you astray; as they do not account for total pageviews per session or the impact that ads have on the value of other ads. This is critical long term. Read this study here about the long-term impact of “CPM optimization”. Determining a good RPM or eCPM for your website is a terrible way to approach revenue optimization. I wrote about why in this popular article. The questions of, “what’s a good eCPM, CPM, or RPM?” is actually the wrong question. As we outlined above, they do not take into account important things like an ads impact on SEO, UX metrics, or traffic. This means you could calculate eCPM, RPM, and CPM metrics that are going up but overall session earnings that are decreasing. If sessions earnings — or EPMV (earnings per [thousand] visitors) — is going down, it is unequivical that you will be making less revenue PER VISITOR. EPMV accounts for the amount of revenue you are earning per session; which means that you can account for how much revenue you are earning when traffic is fluctuating. 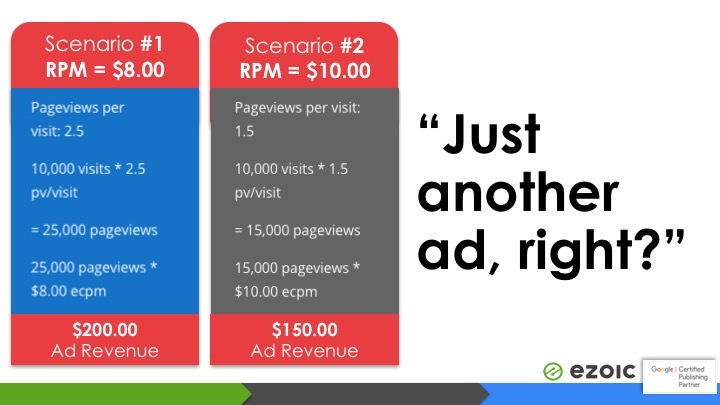 Let’s imagine you have a site with an $8 eCPM (or RPM both work the same in this scenario). You average 2.5 pageviews per visit right now and are making around $200.00 in a predetermined timeframe (nice work). Now, let’s pretend an ad network comes along and offers you a guaranteed $10 eCPM. Obviously, $10 is more than $8, so you naturally accept. Come to find out, the ads that now exist on those pages of your site include auto-play video, numerous ads above the fold, and other annoying elements that cause your users to bounce more often than they did before. This means your average pageviews per visit drop to 1.5. This means that overall you are making $50 LESS than you were in the same amount of time before ($150 vs $200). Is this example always true, absolutely no. But, it is very common to see high CPMs and RPMs going up but total revenue PER VISITOR going down. Ad rates are often lower in January than February. Yet, you decide to compare the 28 days of February vs. the first 28 days on January to see how revenue is performing month over month. You learn that revenue was actually higher in January — when ad rates are traditionally lower! Yikes, you wonder what has happened to RPMs or eCPMs in February to cause this drop when things should actually be going up. If you calculate your EPMV, you can see what assumptions are true and which ones are false. EPMV will actually help you account for traffic differences in this equation. You may learn that EPMV in February was actually higher. This means that it’s possible the difference in revenue is actually only related to less sessions, and not making less money overall from ads. With seasonality, the rise of mobile, AMP, and a million other variables, you need a metric that can help you ensure that you are always going in the right direction. This means that you account for revenue, visitors, bounce rate, and more all together. The best metric for publishers is EPMV (earnings per thousand visitors or “session revenue”). The math behind this is very simple. Take your total site earnings for a period of time and divide it by 1,000 visitors (see image below). EPMV will automatically take into account bounce rate and pagviews per visit. This is the only way to measure that revenue is truly going in the right direction in spite of any outside factors like seasonality. Smart publishers are aware of the fact that often they get high CPM’s or RPM’s (or offered guarantees by ad networks) that don’t always translate to higher site revenue. However, few are actually using EPMV as a metric to keep things on track. I’ve been banging this drum a while. There are few in the ad space that are incentivized to join me; as looking at EPMV or session revenue really offers no benefit to them. However, it does offer a big benefit to publishers. I encourage all publishers to use free advanced analytics on their site to dig down deeper into these things page by page (and landing page by landing page) to optimize their site and make smart objective decisions, or you could let machines make smart decisions for you. NextShould Publishers Convert Pages To Google AMP?